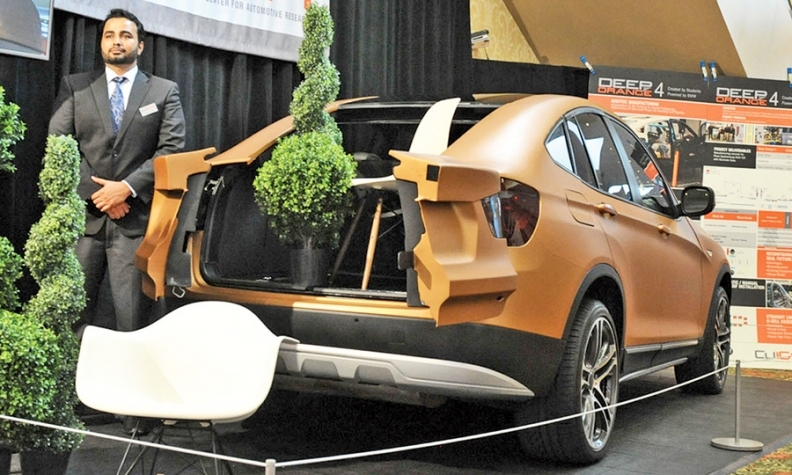 TRAVERSE CITY, Michigan, USA -- It sounds like a long shot, but BMW is taking a keen interest in an X3-derived pickup unveiled at the CAR Management Briefing Seminars here last week by engineering graduate students from a U.S. university. BMW's U.S. marketing, finance and engineering departments directed a team from Clemson University to create a vehicle capable of hauling potted orange trees in the back -- without losing the luxury interior, ride and performance of a BMW sports car, according to Ashish Dubey, the project's manager at Clemson's International Center for Automotive Research. The school is about 100km west of BMW's assembly plant in Spartansburg, South Carolina. The German automaker insisted that any part or material used in the project be BMW-approved. BMW also urged the student team to create a low-cost manufacturing plan to produce up to 5,000 of the vehicles and to bring the hypothetical model derivation in at no more than $8,000 (about 6,000 euros) above the current X3 sticker price. The project is the latest chapter in Clemson's ongoing Deep Orange vehicle prototyping program, which taps auto engineering student creativity to propose next-generation products. For BMW, the grad students devised a factory plan that would cost the automaker only about $10.2 million in assembly line and process alterations to build the concept. They also proposed a low-cost method of altering the existing X3's roof line and body shape by using 3-D printing of structural materials. "It's a BMW with a trunk available for hauling," Dubey said, "but still fit for speed and performance." BMW is not the only automaker that noticed the project. After completing the BMW project and receiving his master's degree from Clemson, Dubey was hired as a product design engineer by Chrysler.